Another Clannad post. Talk about a boring blog. loved it and cried with the characters tears of sadness and happiness. …or found it utterly boring and think it’s some overrated manipulative drama. Either way, you may have enjoyed the drama, the romance and even bits of the totally out of place comedy. But still didn’t fully understand what happened on the final episodes or what kind of sorcery was that. You know that “Oh it was the miracle thingy and all” won’t do for an explanation so here we are. Bellow you’ll find a list of Q&As and a timeline of the story’s events. Hopefully it helps clearing up things for you. For reasons that will be elaborated bellow, the VN can be interpreted according to (A) and the anime according to (B). Why is there a need for time loops or alternative universes? Underneath the beautiful message of family/friendship/cherish life and all, Clannad still is on its core a “get a girl” visual novel. The same kind Key have always done and will likely continue to do so in the future. With that said, a dating game where there’s only one possible outcome would be both boring and unprofitable. So a lot of different routes are created, each for every girl. They may or may not start at the same place but will certainly have a different, separated ending. This makes impossible for a linear script to be written. The solution is either to assume each story as a separated one or make the protagonist suffer from some serious amnesia. That’s why plot devices such as creating separated universes come in hand since you have a way to separate all the stories but still use the same characters and initial setup. Why not give it the Amagami SS treatment then? It would be a reasonable idea… If it wasn’t for some Jun Maeda who decided his common route¹ would also be his main route² and that it would CONTINUE after the actual ending of the VN (that’s After Story). 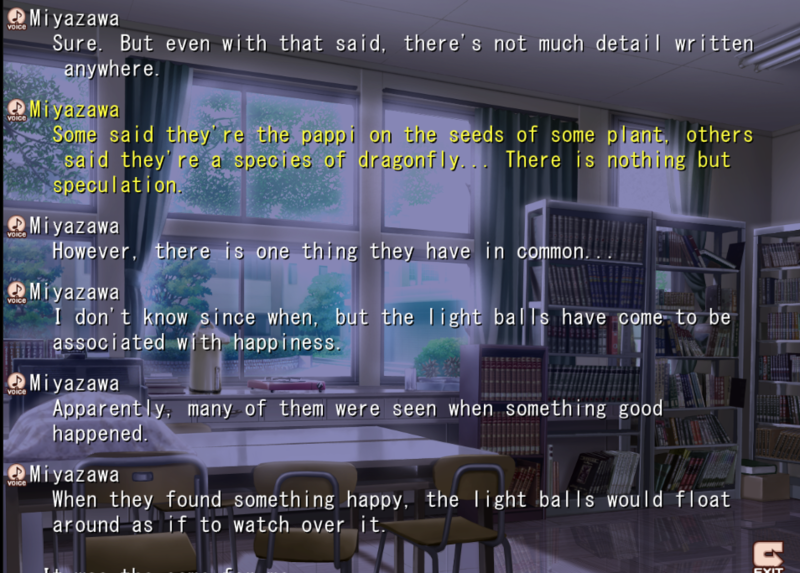 Not only that but in Clannad, events from other routes ALSO impact the main route (light orbs). This creates a huge problem for continuity because you have events that happen at the same time and place but with different characters, in a different setting. ¹ – Common Route: Initial scenes and dialogues that tie all stories together and are likely to be the same for many routes. In Clannad, that’s the first weeks of the school life arc. ² – Main Route: When a VN is biased towards one ending (meaning, there’s more text and development for one story) we call that the main route. 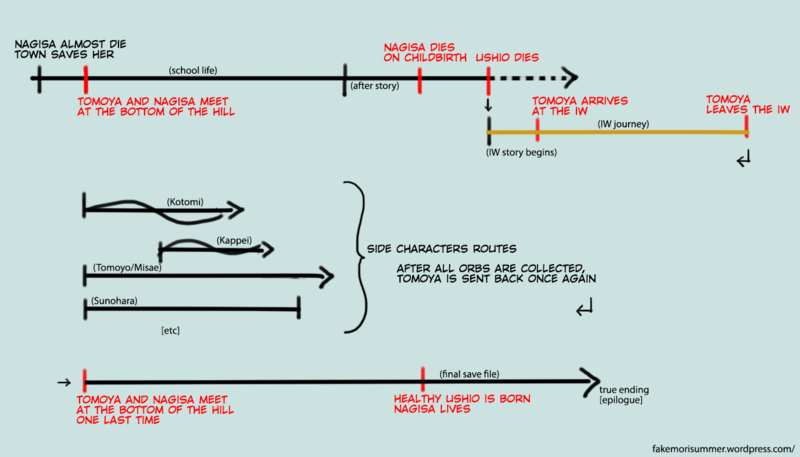 Here it’s Nagisa’s path. What are the light orbs? Orbs are interdimensional, translucent entities that materialize from moments of true happiness. In the VN, they’re defined as “shadows”, therefore projections of something. In this situation, a visible yet intangible projection of feelings (something immaterial by definition). They are the closest to the physical manifestation of happiness, thankfulness, warmth or any other positive feeling that’s created when people find love, friendship, redemption, courage, etc. Their interdimensional characteristic comes from the fact they do not belong on “our” world. Orbs are natural occurrences from the Illusionary World and shouldn’t be visible to humans, yet they are to Tomoya due to his connection to the IW. Orbs can have an “owner”, meaning, if you perform a good deed that brought one of these feelings to others, you may become the holder of an orb. Said orb is capable of fulfilling a dream -which may or may not be also a miracle- and for it to do so, its bearer need only to wish it. This means Nagisa and Ushio came back to life because…? Basically because Tomoya made a wish with light orbs. Period. However, a wish miracle of this magnitude (“I want two people to trick death and one medium soda, please”) couldn’t possibly be performed by a single orb. A larger amount of orbs would be necessary, 13 to be exact. But how could he possess all those glowing lights if he haven’t done anything spectacular during his 19 years short-lived life? So here’s what happened: When Ushio died, Tomoya desperately wished for her to be saved, for his family to be spared from all this DRAMA pilling up. Since he already had one (or some) light orbs, his wish was partially granted and Ushio’s “soul” (or whatever your religion calls it) was then sent to the Illusionary World, a dimension long created by the town they lived in (yes, I’m serious) in order to fulfill his wish completely. Do note that the IW was not created for Ushio, it already existed for thousands of years. Its purpose was to be a mirror of the town’s existence and a “storage” for light orbs. Ushio was instead, the first living thing to be “born” in that dimension. Initially with no idea why or how, she would eventually meet with a special light and make a robotic body for it (Tomoya). There’s a cute symbolism here, if you pay attention. She could’ve built anything to be a vessel for that light. However, she builds a robot. Exactly the same thing as her father’s first gift to her. This goes to prove that, even though she didn’t have her memories from her short existence on human world, the love connection she shared with Tomoya was strong enough to motivate her actions. They would then go on a journey that climaxed on Ushio discovering her purpose there and sending Tomoya back on space/time to collect more Orbs in order to perform a miracle. This doesn’t make any sense? Keep reading. Parallel universes with Time Loops? The only way for Tomoya to collect the amount of orbs necessary to save Ushio and Nagisa from death was to somehow collect them by doing meaningful acts before the day of Nagisa’s delivery. To do so, he is sent back to the point where he first met Nagisa and set the wheel of fate spinning: the bottom of the hill. From there on, he would semi-consciously start “farming” these orbs. This is where the significance of the supportive characters is put into discussion. If we see Tomoya’s interactions with them as simply tools for saving his loved ones with no actual emotion involved, it would be a pretty cruel story and if we think about it, orbs wouldn’t even materialize because they weren’t “true” feelings. That’s why the VN hints you that all the routes take place in alternate, yet parallels, universes (Kotomi’s parents research). These universes were created the moment original-Tomoya made his wish. However, a Kyouroute-Tomoya and a Tomoyoroute-Tomoya for example, will have no idea of that master plan and will fall in love with their respective route’s girls like an average guy would. With the purest, finest feelings as possible. You can speculate this isn’t true for all the routes, and that some are on the same universe, just part of the time loop Tomoya is sent on. 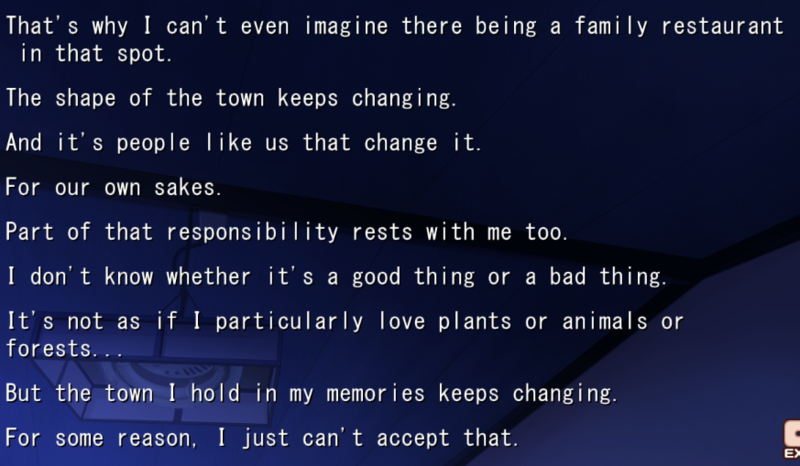 That would be the case for the routes that doesn’t end with a romantic relationship or doesn’t affect the final outcome of After Story (Sunohara, Misae, Kappei for example). This way, every route becomes meaningful, with honest interactions and alternative-Tomoyas living happily ever after. Though, due to length and focus issues and also to create a semi-linear script, the anime couldn’t explore into depth neither the IW nor the light orbs, so the story is organized in a fashion that resembles a time loop. This time, all the romantic relationships with the obvious exception of Nagisa are suppressed, and hence the orbs which would come from them also are. All characters are merged into a single storyline and are introduced at different points of plot development, with Tomoya collecting orbs continuously as he meets and helps them. To avoid a paradox (IW existing before it was created) the story we watch during the anime is already set INSIDE a loop. That is: Tomoya obviously didn’t collect enough orbs on the first run, so he was sent back and back again until he helped enough people to acquire the required amount of orbs. This will be better explained further bellow. Keep reading. Town, Nagisa, Ushio and the Illusionary World? Just like other Key works (Air, Rewrite, Planetarian) you need to understand that the town where Clannad takes place is a living organism. This town, whose life-force comes from both the nature and the people living within it, has a will of its own. At the same time, this strength and will wavers according to human’s actions toward each other and towards nature itself. Years before the beginning or the anime/VN story, when Nagisa was on the verge of dying (due to, likely, pneumonia) Akio took her to the woods and begged for someone to save Nagisa. The town answered his prayer and lent a bit of its life-force to her. On that moment a connection was created between Nagisa, the town and the IW. However, as progress and technology constantly impacted the small city, green life was constantly destroyed and with that, Nagisa’s health was also often impacted. 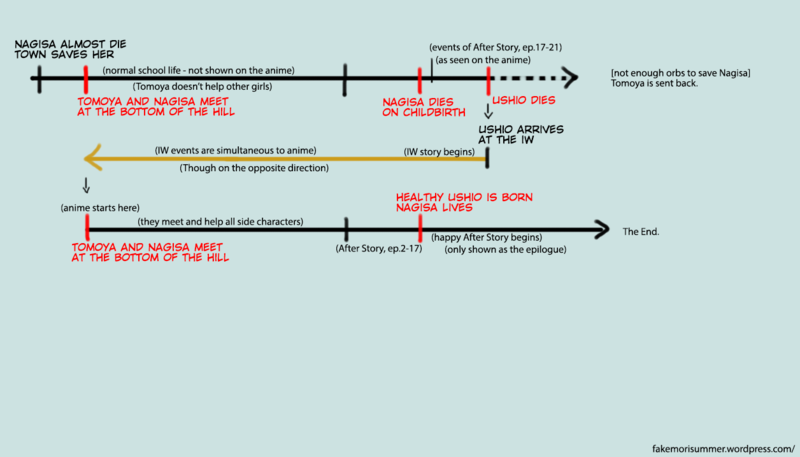 That said, when Ushio is born there is not enough energy to support two lives and, with Nagisa’s death, her connection with the town is transferred to Ushio. Ushio unfortunately is bound to suffer from the same fate of Nagisa, HOWEVER, the moment she dies the town sends her consciousness to the Illusionary World, so she would learn about the orbs and instruct Tomoya to embark on a space/time voyage to save his family. She then sends him over and over again into a multiverse (or time loops) for him to obtain the required orbs. Each and every time starting at the bottom of the hill where Tomoya first met Nagisa, and always presenting him the choice of continue trying or giving up. Tomoya then lives everything again from that moment to the day Ushio dies on his arms. Until finally, when he finally acquires 13 orbs and goes on his journey once again, on the day Nagisa gives birth his journey changes. His wish (a miracle) is granted and a healthy baby is born from a healthy mother. The connection between Nagisa and the town is broken; Ushio is released from the IW and born is this world*; the IW resets to its dormant state. Happy ending. 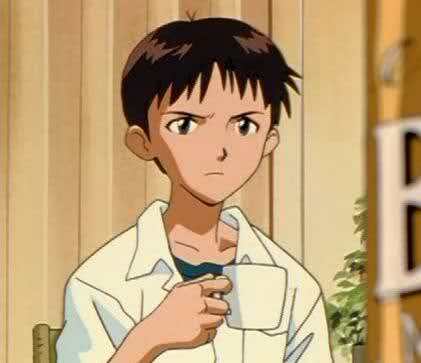 * – Not exactly… Ushio’s significance is a discussion that could make an entire new post. It can be argued that she, not Tomoya, is the one who made the ultimate sacrifice to save her family. Tomoya had to embark a odyssey of time loops, sure, but Ushio watched over him during all this time, all alone in a world that has ended. Not only that, but assuming she is “released” from the IW the moment the miracle happens is also open to speculation as it will be discussed here in a topic further bellow. This is a tentative way of explaining the story through a linear sequence of events. If this is a loop, that means what we watched/read isn’t the first? Exactly. 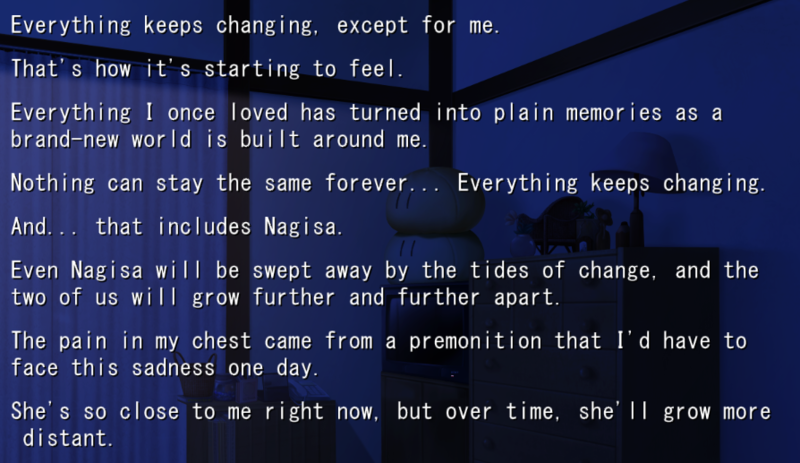 The easiest way to prove that the story we follow is not the “first lap” in a time loop is to think about the dreams both Tomoya and Nagisa had with the IW. If there was no time loop, how could they have those dreams without creating a paradox? Not only that, but during the Founder’s Festival arc, Nagisa clearly remembers how the story ended, she says “they sing at the end” which is exactly what happened. For the VN, it’s even more obvious: Every time you reach a bad end, a scene from the IW is played where the robot is stuck on snow wondering if he has failed on his objective of saving the girl. The scenes from the IW we read through (VN) or Tomoya dreams of (anime) are NOT necessarily simultaneously happening. They are dreams of the past. But how can they be dreams of the past if they happened on the future? Exactly because we are inside a time loop. The Illusionary World “existence” took place after Tomoya witness the death of Nagisa and Ushio. After a distant, sordid, ugly future where both of them are dead and God knows what Tomoya is up to -assuming he didn’t kill himself. What we see of the Illusionary World are glimpses of memories from it. After Ushio dies, she’s sent to the IW. Some time period later (years, minutes, who knows, time is relative) Tomoya’s consciousness arrives at the form of a light orb. They then live their boring lives on the IW, and decide to leave that world. During that journey they reach a point where none can go any further and that’s when Ushio understands her purpose. She then sends Tomoya back (plain and simple deus ex machina) for him to unlock the true ending. Tomoya goes over those 3 years again and Ushio continues to watch over him (now in the form of the IW) giving him orbs of light as he does good stuff. [Anime only] On the final IW scene, the girl tells the robot she needs to stay on that world. Why is that? This is also a change from the VN made to the anime that causes some confusion. The dialogue they have under that snowstorm is the exact same of the VN. From the girl’s explanation of what is the IW, to her final words (sayonara, papa). 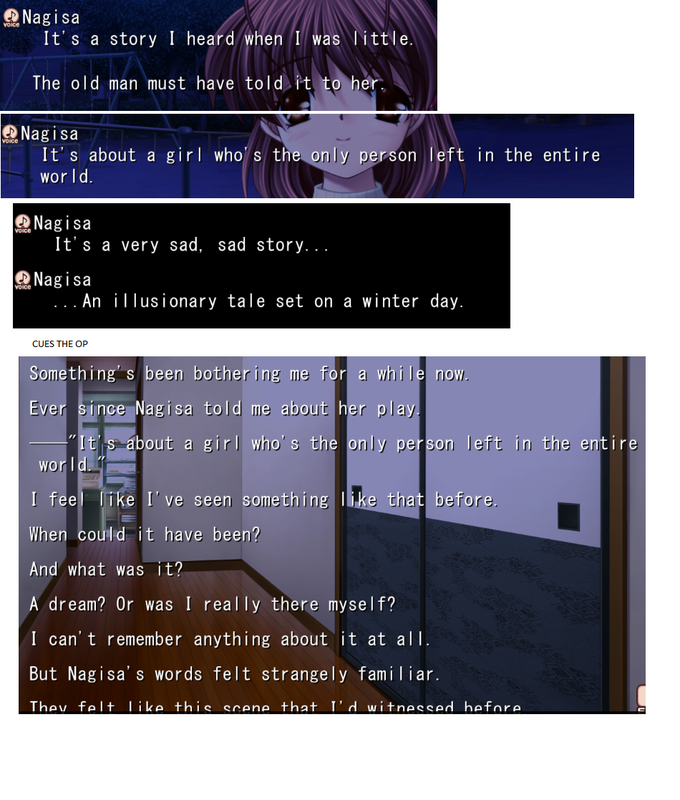 However, like explained above, on the VN that scene takes place before the bad end. It happens after Ushio dies and when it ends you’re thrown back to the main menu, so you can play Akio’s route (the final light) and unlock the true ending. That’s why the girl needs to stay on the IW and Tomoya needs to go. Why she says “I have become the will of this world” and why she tells him “you’ll soon wake up in a very important moment”. She isn’t talking about Ushio’s birth but the first scene of the anime, the scene where Tomoya meets Nagisa on the bottom of the hill. It’s not the IW getting destroyed on that scene but instead Tomoya being purged from it and sent back to the “normal-world”. The reason why this was changed on the anime and the scene was added right before the true ending is once again due to the linear characteristic of the script. [VN only] So according to your interpretation that there are multiple dimensions, this means there are currently two Ushios in existence. One living happily as a kid being raised by Nagisa and Tomoya and another that isn’t human anymore but instead part of the town and the ruler of IW? Yea… That’s spooky and correct. Either you can say that, or interpret it as just one Ushio but with a bit of hers connected to the IW. [Anime only] Why does Ushio wanders around town and goes to sleep in that corner of the new hospital? Because those trees are what’s left of the place where Akio begged for Nagisa’s life. So in a sense, there’s a bit of Nagisa there (a connection between them) and as Ushio subconsciously misses her mother, she goes there trying to feel more at ease. [VN only] Wasn’t it the IW girl instead of Ushio sleeping on that corner at the end? Yea. They fucked up. My bet is that Key tried to make the connection with the main menu and finally showing us what the girl looks like with that scene (remember she doesn’t have a char. render), but it just got confusing since it’s almost like they are implying ‘IW girl =/= Ushio’. Thankfully they cleared this misunderstanding with the “Clannad: Recap” OVA where it’s shown that it was indeed Ushio sleeping there. What’s with Fuko awkward dialogue of “I smell something cute” with Ibuki-sensei? When Fuko first meets Ushio she says she’ll remember “her cute smell”. That’s why she says something that smells “cute” is sleeping under those trees. What about Tomoya’s fear of change? Not only a metaphor for his fast changing life (from a dull existence to a heart-warming relationship) with him projecting on the city his own fears of not being able to keep up with new responsibilities and duties. But also some foreshadowing of the drama hammer which was about to be dropped. How many orbs are there? 13. It would be 14 but you waste one making a wish for Fuko to get out of the coma. Ironically, no lights are earned from Nagisa. Heh. Obviously there are multiple different interpretations out there. Also have some detailed analysis worth checking out if you aren’t satisfied or doesn’t agree with mine. Other than that, as far as references go, this was entirely made by me. I didn’t copy anybody’s else work nor took this straight out of my imagination. 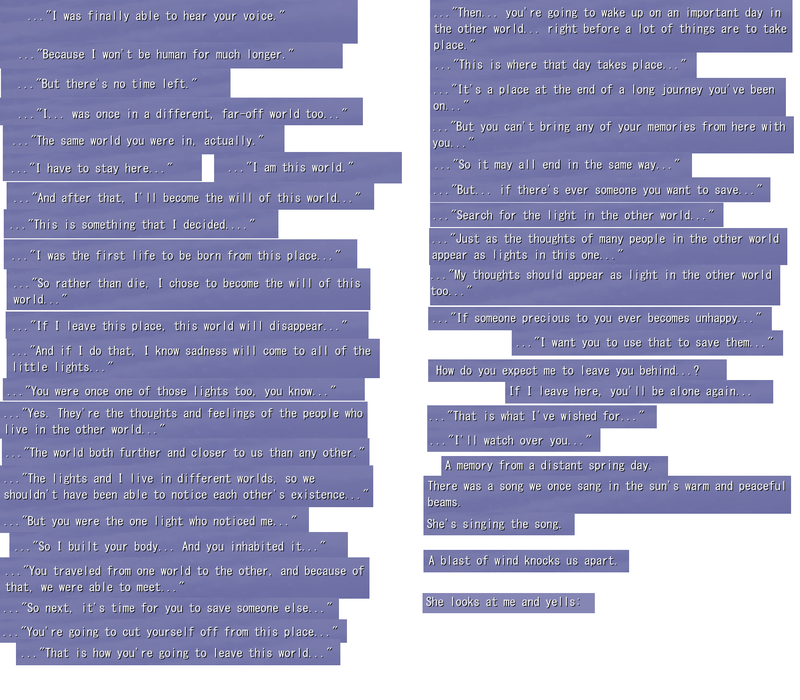 All the claims I made here are based on 300 hours of VN gameplay (completionist run) on both fan-translated and Sekai Project versions of Clannad (full voice edition), and my own interpretation of the anime dialogue, scenes & symbolism. This is probably one of the best explanations I’ve read. The only tiny thing I disagree with is that there are two ushios, instead I feel that she is one being with her spirit being split between the worlds. Either way, great job! Very detailed and helpful! Hey, thank you so much for your in-depth explanation, it made a lot of sense, it has helped me reconcile more than I did before, I do have one question though, at the last loop he let nagisa walk past and then he called out her name, in the others he didn’t do that, so why did they both know each other at that time?